The Google Nexus 7 was the most highly anticipated Android tablet after the Kindle Fire last holiday season. However, many are expecting the Nexus 7 to eclipse the sales of the Kindle Fire which is the best selling Android based tablet to date. The main advantages to the Nexus 7 over the Kindle Fire is that it actually runs the Android operating system in it’s latest release called JellyBean. The Kindle Fire runs it’s own software on top of a previous version of Android. Amazon also created the Kindle Fire to use their own content ecosystem backed by over 15 years of experience in online sales. Unlike other Android devices theKindle Fire can’t access the Google Play store or any apps out of the Google Play Store’s app place, instead they use the Amazon app store, Kindle store and Amazon movies. The Nexus 7, was designed by Google and their hardware partner for this project, Asus. With each new major release of the Android operating system Google picks a hardware partner to market a “Nexus” branded device which is the developer and reference device for that version of the operating system. In this case Jelly Bean debuted on the Nexus 7 tablet. The Nexus 7 was introduced at Google’s annual developer conference held at the end of June. Google I/O sees thousands of developers specializing in all the varieties of Google products for a three day conference similar to WWDC for Apple developers. At Google I/O, Google and their partners typically launch key flagship devices. Despite Android being the dominant operating system across the country and around the world, it’s hard to pinpoint the most successful Android devices because of fragmentation. At last count there were over 400 different devices world wide running Google’s mobile operating system. As for the Nexus 7 it was highly anticipated because of it’s native Android operating system, the new version of Android, superior hardware and the seven inch form factor. There are rumors that Apple is going to produce a smaller version of the iPad in a 7.8″ frame to compete with Google and Amazon. Retail stores and web direct sales started selling the Nexus 7 last week. 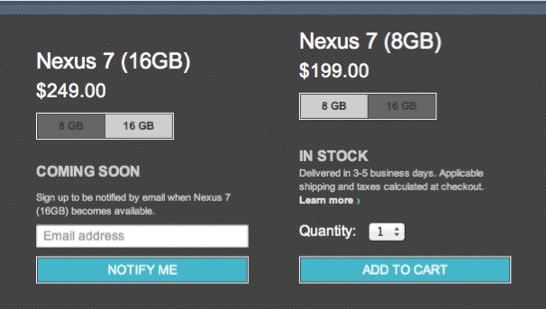 Google stopped selling the 16gb version of the Nexus 7 yesterday after running out of inventory. Various online sites are reporting that local big box retailers still have limited quantities of the 16gb version. Best Buy, Staples and even Game Stop were retail partners for the Nexus 7. Google tried their luck with direct to consumer sales a few years back with debut of the Nexus devices called the Nexus One. That Android powered device was made by HTC and sold in two varieties on Google’s website and not in retail stores at first. After a few short months Google got out of the direct sales business. Many were surprised when they announced that they would return to direct sales with the Nexus 7. Unlike the previous attempt though the Nexus 7 is being sold in Brick & Mortar stores and other online sites as well. It appears that Google has not responded to anyone yet with comment on the amount of units sold. Google tends to keep actual sales numbers like this close to the vest. Google did not report actual hardware sales for their Motorola Mobility unit that they purchased early this year for over $12 billion dollars.